As part of the regeneration of Douglas, the Isle of Man capital, Artscape paving was installed along Regent Street, near to the promenade. 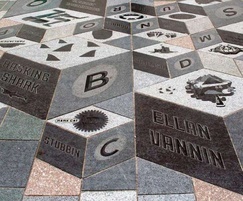 The paving commemorated the legacy of the designer Archibald Knox - a Manx designer of Scottish descent. Knox was Liberty's primary designer at the height of their success and one of the foremost influencers of the English Art Nouveau movement. The Artscape paving project, initiated by the Douglas Development Partnership, commemorated the 150th anniversary of Knox's birthday by re-interpreting his artwork in stone. Hardscape worked with designs produced by BCA Landscape of Liverpool and used waterjet-cut techniques to produce intricate etched detailed finishes to the granite mixes used for the paving. The design featured an A to Y of Manx - it shows 24 letters, each focusing on something from the Isle of Man. The stone paving was installed by the Department of Infrastructure, Isle of Man.